The Florida Museum research building hosts a rotating exhibit highlighting recent student research guided by a Florida Museum mentor. Posters are on display at Dickinson Hall for one semester and then permanently archived on this website. Contact information for current Museum graduate students is available on the Graduate Student Directory, through links to the University of Florida departments, or via the Florida Museum mentors. Click any poster to download the PDF. Dogs (Canis lupus familiaris) are among the most common animals in faunal assemblages at Maya sites. 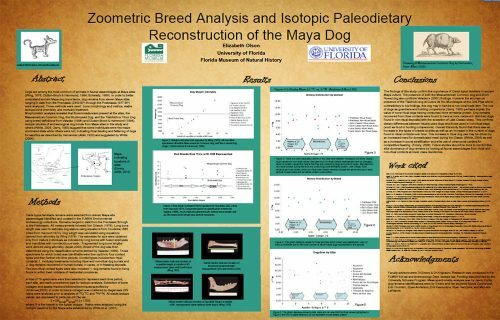 In order to better understand ancient Maya dog importance, dog remains from eleven Maya sites ranging in date from the Preclassic (2350 BP) through the Late Classic (977 BP) were analyzed. Three methods were used: bone morphology and metrics, stable isotope bone chemistry, and mortuary treatment analysis. By combining these data sets this study finds trends in dog dietary pattern through time, between regions, and breeds. Florida Museum Research Mentor: Jonathan Bloch, Vertebrate Paleontology, Committee Chair for A. Hastings, J. Bourque, and E. Cadena. The largest extant snakes live in the tropics of South America and southeast Asia where high temperatures facilitate the evolution of large body sizes among air-breathing animals whose body temperatures are dependant on ambient environmental temperatures (poikilothermy). Very little is known about ancient tropical terrestrial ecosystems, limiting our understanding of the evolution of giant snakes and their relationship to climate in the past. 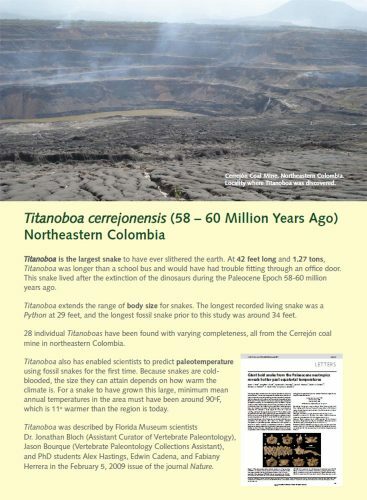 Here we describe a boid snake from the oldest known neotropical rainforest fauna from the Cerrejón Formation (58-60 Myr ago) in northeastern Colombia. We estimate a body length of 13m and a mass of 1,135 kg, making it the largest known snake. The maximum size of poikilothermic animals at a given temperature is limited by metabolic rate, and a snake of this size would require a minimum mean annual temperature of 30-34oC to survive. This estimate is consistent with hypotheses of hot Palaeocene neotropics with high concentrations of atmospheric CO2 based on climate models. Comparison of palaeotemperature estimates from the equator to those from South American mid-latitudes indicates a relatively steep temperature gradient during the early Palaeogene greenhouse, similar to that of today. Depositional environments and faunal composition of the Cerrejón Formation indicate an anaconda-like ecology for the giant snake, and an earliest Cenozoic origin of neotropical vertebrate faunas. Although sharks are apex predators in the oceans, juveniles are susceptible to being preyed upon by larger individuals. Females give birth in shallow environments called nursery areas to protect their offspring from predators. The extinct shark (Carcharocles megalodon), is the biggest shark that ever lived. Fossil teeth C. megalodon are found in the Late Miocene Gatun Formation of Panama, where we have collected and measured a number of teeth. Surprisingly, no large teeth are present. We have compared these specimens with different teeth from analogous localities. In addition we have calculated the total length of the individuals found. These comparisons and estimations suggest that C. megalodon sharks from the Gatun Fm. were mostly juveniles. During the Late Miocene the Gatun was a productive, warm shallow-water marine environment. We propose that the Gatun Formations represents a nursery area during this period of time and that C. megalodon spent their juvenile stages in this area that provided them protection. It is urgent to promote biodiversity conservation through sustainable development in the Amazonia, where less than 30% of forests remain and more than 75% of people are poor. Butterfly farming is a potential sustainable strategy. Temporal and spatial patterns of butterflies (where and when they occur) were determined, which helped to establish the basis for butterfly farming in the region. 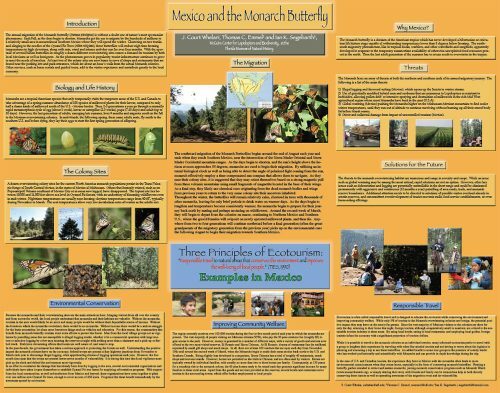 Material for environmental education and a book will be published containing these results to emphasize the importance of rainforest, popularize butterfly diversity and offer information for farming initiatives. 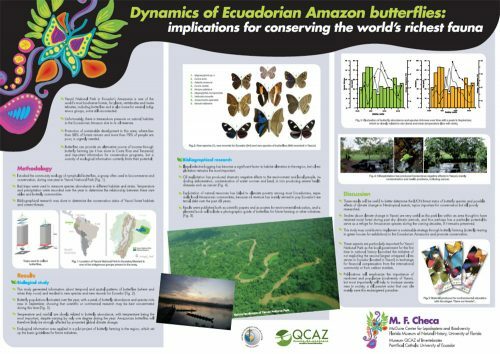 This data is also useful to assess the IUCN conservation status of butterflies and determine possible effects of climate change. Suitable habitat for organisms consists of open access to important and essential resources, such as light and nutrients for plants, and food and nesting sites for animals. While these resources may be physically present in a habitat, they may not always be accessible to the organisms that need them to survive. 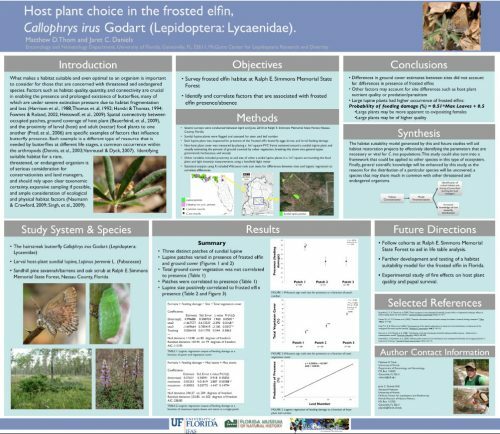 A study investigating host plant choice by the frosted elfin butterfly, Callophrys irus, was conducted at Ralph E. Simmons Memorial State Forest in northern Florida in the spring of 2010. Resource use was measured by conducting surveys of the larval host plant, sundial lupine, Lupinus perennis. Occupancy by eggs and larvae and presence of larval feeding damage were recorded and compared to host and non-host vegetative characteristics such as sundial lupine density and grassy, herbaceous, and woody plant cover. Statistical analysis using logistic regression revealed lower occupancy of sundial lupine where non-host plant cover was high, and highest occupancy where non-host plant cover was low to intermediate. The low occupancy of host plants that were densely surrounded by vegetation suggests that factors such as apparency, quality, or access may influence oviposition preference. Reduced occupancy from increased nearby vegetation has important effects on the population at this site, and management should take into account non-host plant crowding of sundial lupine in order to preserve and promote this population of a rare butterfly. The annual migration of the Monarch Butterfly (Danaus plexippus) is without a doubt one of nature’s most spectacular phenomena. Each Fall, as the days begin to shorten, Monarchs get the cue to migrate by the hundreds of millions to a relatively small area in mountainous Southern Mexico where they will spend the winter. Clustering on tree trunks, and clinging to the needles of the Oyamel Fir Trees (Abies religiosa), these butterflies will endure night-time freezing temperatures in high elevations, along with rain, wind and intense mid-day sun for over four months. With the spec¬tacle of several billion butterflies in roughly a dozen different overwintering sites comes a demand for tourism by both local Mexicans as well as foreigners. As the phenomenon grows in popularity, tourist infrastructure continues to grow to meet the needs of travelers. At least two of the colony sites are now home to rows of shops and restaurants that are found near the parking lots and park entrances, which are about an hour’s walk from the actual Monarch colonies. Other services, such as horse rentals and guided tours, add to the visitor experience and contribute greatly to the local economy. The Amphiesmenoptera are a highly diverse clade of endopterygote insects that includes Lepidoptera (butterflies and moths) and Trichoptera (caddisflies). We built a comprehensive phylogenetic framework of Amphiesmenotpera that reflects both the rapidly growing sequence data and the computational advances that allow for large-scale phylogenetic analyses. We first assembled all potentially phylogenetic informative sequence data from Amphiesmenotpera and selected outgroups in GenBank. After pruning questionable or anomalous sequences and editing the alignments, homologous sequence clusters with more than 100 taxa were concatenated into a single phylogenetic “supermatrix” that contained 5609 taxa, representing by far the largest possible Amphiesmenoptera data set. Maximum likelihood phylogenetic analyses on the supermatrix revealed a credible phylogenetic hypothesis that raises intriguing evolutionary questions and suggests directions for future data collection. 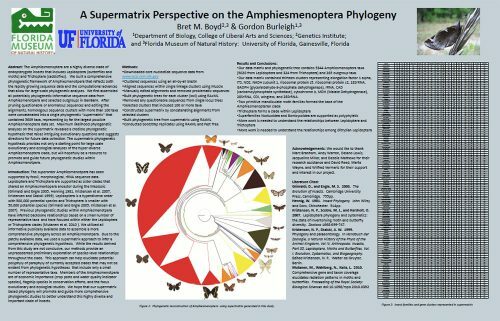 The supermatrix phylogenetic hypothesis provides not only a starting point for large scale evolutionary and ecological analyses of the hyper-diverse Amphiesmenoptera clade, but will hopefully be a resource to promote and guide future phylogenetic studies within Amphiesmenoptera.